Dunston Hill was the first campsite that the Camping in Britain team reviewed, and there’s a good reason for that – it’s one of our favourites! They have a new website so we thought they deserved a new review. Pelcomb Cross is very easy to find, located directly off the main road between Haverfordwest and St. Davids, just past the Pelcomb Inn pub, down the hill on the right, past the garage (the pub is owned by the same friendly family, and the garage is a very well stocked supermarket and takeaway, literally just outside the campsite). Don’t let the word ‘main road’ confuse you, in West Wales, many of the roads are quiet. 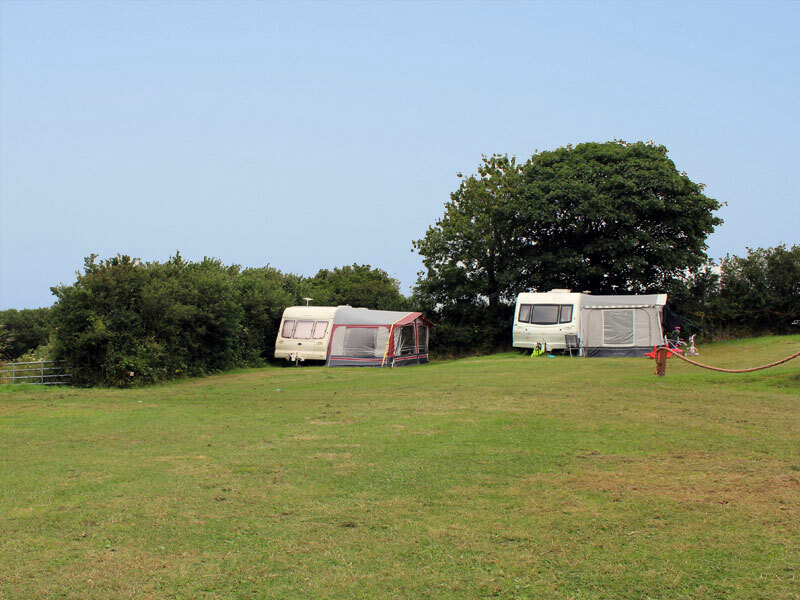 The site is medium sized and generally friendly, with good facilities, and plenty of green space, although many of the pitches are rented by seasonal caravan owners, so booking ahead is advised. 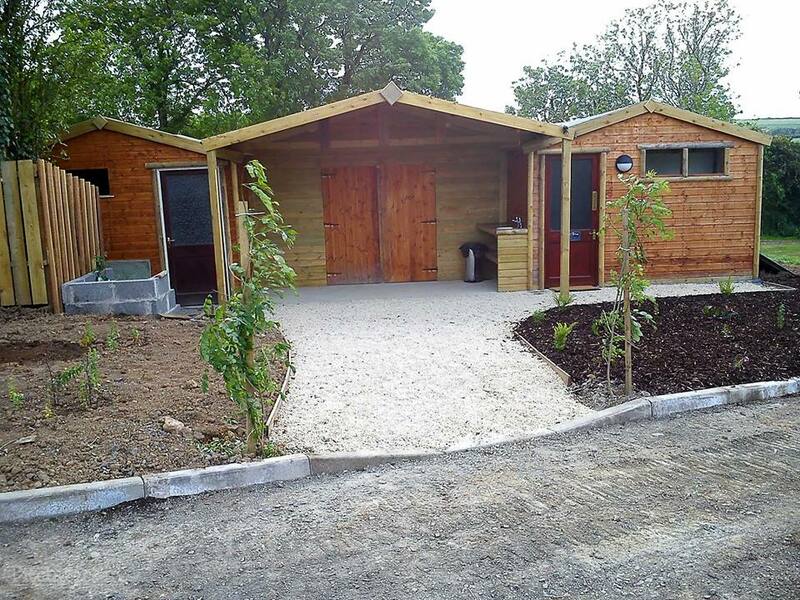 There are two shower and toilet blocks, with ample cubicles, as well as a handy games room to keep the kids amused. That said, with open views across the hills at the back of the site, as well as sheep and lambs in the field behind, the children are normally to found playing happily at the bottom of the site, thanks to the amount of seasonal pitches many of them have made long-term friends, and are happy to welcome new ones too! We originally came because our then Diablo 10 was too big for most of the other campsites in West Wales, and the site does not charge a supplement for jumbo tents, but we’ve kept returning thanks to the warm welcome – the owner is super friendly and has even helped us pitch the tent when winds overpowered us – and if there are follow campers on site, they are also happy to pitch in! 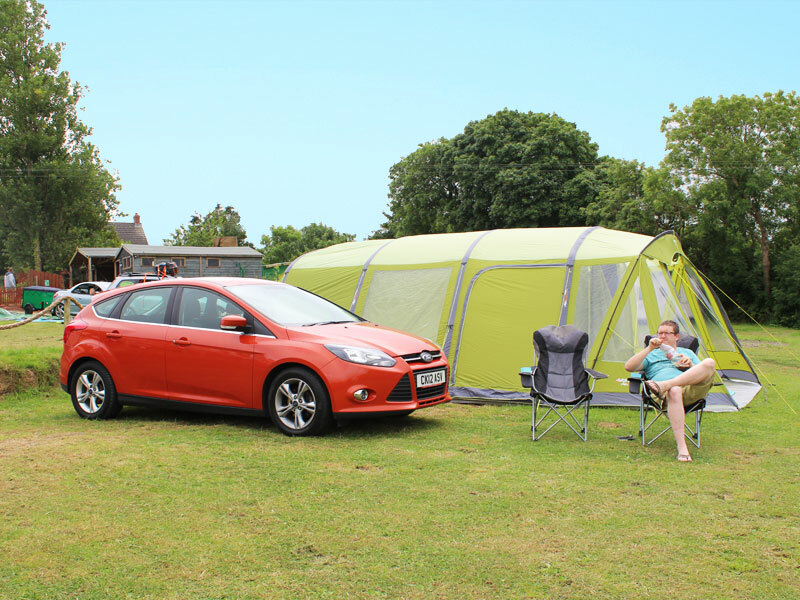 That welcome extends to the nearby pub, the locals are friendly and the homemade food is delicious – and Dunston Hill campers get a discount! While the site is very relaxing and has views across rolling hills, many people wish to get out and about and they won’t be disappointed at Pelcomb. The town of Haverfordwest is less than 10 minutes drive, where you will find the remains of a Norman castle. The castle was established during Norman times in 1120 but much of the architecture remaining today is dated to 1290. For centuries the castle was an English stronghold. There are several other notable castles in area; Wiston Castle lies 6 miles (9.7 km) to the northeast and Pembroke Castle lies 12 miles (19 km) to the south. The town has a number of places to eat and drink, large and small supermarkets and a popular shopping area. Continuing along the coastal road will take you past some of West Wales most stunning scenery, and lead you to the tiny city of St. Davids, a 15-20 min drive away. The ancient Cathedral is a sight to behold, although our secret confession is that we go for Mary’s Farmhouse Ice Cream in a tiny shop on the corner! However, be warned, the Cathedral is a steep walk back up the hill to the shops and cafes! Unspoilt Marloes Sands is just 3.4 Miles from Pelcomb Cross. Managed by the National Trust, Marloes Sands is simply breathtaking, and is a great place to visit for fossil-hunters. It is very remote and uncrowded, even in summer, making it a great place for coastal walkers, with pretty views of the beach as well as Skokholm Island and Gateholm Island. It is about a 15 minute walk to the beach from Marloes Mare car park (charges apply). Boat Trips can be booked in advance to the local nature reserve islands of Skokholm and Skomer to see the seals and huge quantities of nesting seabirds. Carry on a little further down the A487 (for less than 10 minutes) and you won’t miss Newgale Beach. The approach alone is breathtaking. The huge expanse that is Newgale beach boasts stunning scenery and perfect surf, as well as three car parks (charges apply), two surf shops, a pub and a cafe. Perfect for a family day out, or to find those absolutely essential Reef flipflops in that well stocked seafront surf shop (ask the webmaster! ), this is one view you won’t want to miss. As the crow flies, Pelcomb Cross is very close to Broad Haven, but because this little resort in the middle of rural Pembrokeshire, it is a 14 minute drive. Click here for directions. Despite being accessed away from the main A-Road, Broad Haven is the most commercial of the local beaches – it is a perfect family beach resort, with a broad, sandy blue flag beach, rock pools and to the north end of the beach is the craggy Lions Head. However, at either end of the beach, the rocks make for interesting walks for grown ups too (as seen in the photo taken by one of our campers!) There is a a well stocked water sports shop near the sea front with surf board, paddleboard, wetsuit and kayak hire, as well as numerous cafes, ice cream shops and pretty little traditional souvenir shops. Oakwood Theme Park is Wales’ Biggest Family Adventure located in Pembrokeshire, West Wales. With over 35 rides and attractions spread over 90 acres of spectacular countryside, we have something to offer the whole family. Whether you are looking for young adventure, family adventure or adrenaline adventure, you will have an amazing fun filled day out! Here at Folly Farm you’ll find four big attractions all in one place – a friendly farmyard, spectacular zoo, enormous vintage funfair and an imaginative range of indoor and outdoor adventure play! Set in the stunning Pembrokeshire countryside, Folly Farm is a farm diversification success story. In 1988, this former dairy farm with the same name, opened its doors to the public to demonstrate how its cows were milked. Nearly 25 years on, Folly Farm is one of the top paid-for visitor attractions in Wales and wins awards for it. Come and join us for a day of fun and nostalgia with these majestic “gentle giants”. There is plenty for the whole family to do, whatever the weather! Rides, Animals and Demonstrations all included in the entrance price. Who is this site good for? We’d recommend this site for families, couples and anyone who loves great food, feeling part of a small, local village that take you to their hearts, easy access to fabulous scenic locations and those, like us, who have huge tents, want good signal on a phone network (we’re on 3, EE and Vodafone and all get fabulous signal) and want a laid back site.